This is the guidance for ticket purchasing for IBSA Blind Football World Championships 2014 held in Tokyo from Sunday, 16th November 2014 to Monday, 24th November 2014. Please ask your tickets via email after reading explanations below. 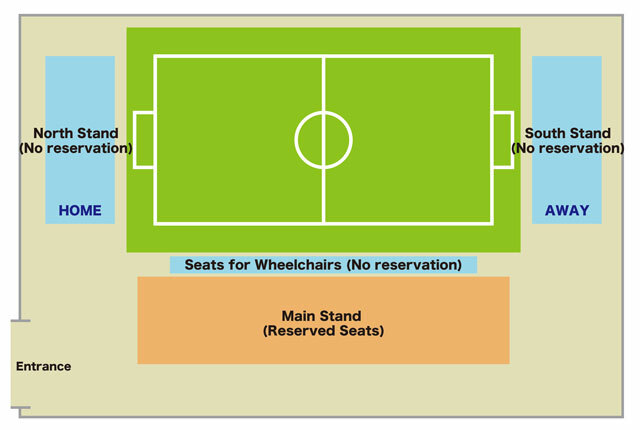 Reserved seats on the Main stand, seats without researvation on the North and the South stand and seats for wheelchairs are available. One ticket is for 2 matches. 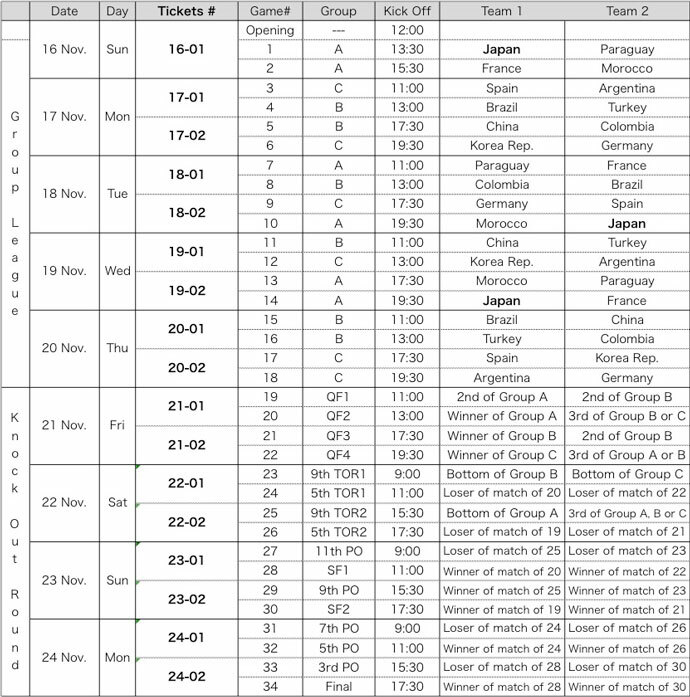 See the fixtures to check a pair of matches. *Pre-school children are free to enter unless they need individual seats. If need it, please purchase ticket for U-18. *Tickets may not be sold on the day due to sold-out of advanced tickets. *Free tickets, for U-18, of group stage matches excluding matches of Japan, lower group knock out round and the placement play off are on a first-come-first-served basis. If it is needed to secure your seats, purchasing tickets in advance is strongly recommended. *Participating nations can be seen on the website of the World Championships 2014. Tickets are available via email. Please send email with the information below to b-village@b-soccer.jp. name, address, phone number, email adress, date, game number, preferred seats (the main stand, the north stand, the south stand or seats for wheelchairs), the number of tickets. Please note that we ask you to write “Tickets for IBSA Blind Football World Championships 2014″ on the subject of the email. Q.Where are tickets sold on the day? A.Tickets are sold on the day at the ticketing centre near the entrance of the venue. Tickets may not be sold on the day due to sold-out of advanced tickets. Q.How many tickets are available at a time? If more tickets are needed, please send email to b-village@b-soccer.jp separately. Q.How to pay the fee? A.Payment is available at the venue. Q.when payment should be done or tickets should be collected? A.Please pay and collect your tickets at the venue. Please note that photo ID is required when you collect your tickets. Q.From how old is ticket required? A.Pre-school children are free to enter unless they need individual seats. If need it, please purchase ticket for U-18. Q.Are there any discounts for disabled people or their helpers? A.No, there is no discount. Q.Are there toilets for wheelchair? A.Yes, there is one toilet for wheelchair at the venue. Q. Can my companion watch the match together? Which ticket should be purchased? A.One companion are allow to buy a seat on the stand for wheelchair. Please purchase a ticket for wheelchair. Q.Is it possible that only companion watch matches when a person using wheelchair cannot come to watch the match on the day? A.A companion have to be with a person using wheelchair. In the case, a companion will be guided to other the north or the south stand. Q.What time is the venue open on the day? A.Gate will open 1 hour before the opening ceremony on the 1st day and 1 hour before kick off of the first match and the third match on other days. Details are written on the tickets. Q.Is there roof on the stand? A.No, there is no stand. Q.Is there any notes to care for watching or things to bring? A.We recommend you to bring a raincoat and a rug. Using umbrella is not allowed on the stands. Q.Is it allowed to use telephoto lens and Tripod on the stands? A.Lens with the length of over 20cm and tripod are not allowed to use on the stands. A.Smoking is allowed only at the designated place in the venue. A.There is no parking in the venue. Please park at other parking space or we strongly recommend to visit by public transportation.